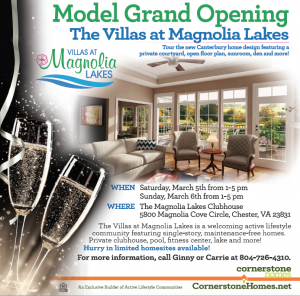 Magnolia Lakes Celebrates A New Home Design Grand Opening! Our most popular home design just got even better at the Villas at Magnolia Lakes.. The "Canterbury" is a must-see! A very livable design with you in mind! Tour our fully decorated model home and our fabulous amenities. Then enjoy a sip of champagne in the community clubhouse, and meet current homeowners who love living here! The Villas at Magnolia Lakes is a welcoming active lifestyle community featuring single-story, maintenance-free homes. Private clubhouse, pool, fitness center, lake and more! Hurry in limited homesites available! For more information, call Ginny or Carrie at 804-726-4310.